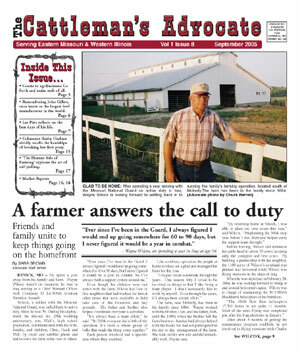 The Cattleman's Advocate newspaper is printed monthly and started out being mailed free of charge to customers and friends of Eastern Missouri Commission Company (EMCC), as well as distributed to many feed stores and gathering points in our trade area of Eastern Missouri and Western Illinois. Its growth and popularity resulted in the need to charge a reasonable subscription fee to cover some of the production and distribution costs. It is still the primary news and information source used to contact all of EMCC's many buying and selling customers. In October of 2012, the owners of EMCC purchased the former Farmers Livestock Auction LLC in Boonville, Mo., and it became Missouri Valley Commission Company (MVCC). The Cattleman's Advocate grew once again, as its mailing list and coverage area expanded to West Central Missouri as well. Now, in addition to EMCC's primary news and information source, The Cattleman's Advocate is also the primary news and information source for MVCC. Direct mail circulation is currently about 3,600 papers to subscribers and about 100 free pickup locations in an area from west of Boonville to western Illinois, and from north Missouri down to the St. Louis area. Another 500 or so papers are distributed by hand at various locations in Bowling Green, Boonville and Centralia. If you do not currently receive a copy of The Cattleman's Advocate and would like to subscribe, send a request with your name, address and phone number to: A&S Printing, P.O. Box 124, Monroe City. MO 63456, along with a check for $20 for one year. Questions about the editorial content for the publication should be directed to: The Cattleman's Advocate, P.O. Box C, Centralia, MO 65240 (Jon 573-682-4656). Advertising, layout and design are handled by Chuck Herron at Virtual Images. He can be contacted by emailing cattlemansadv@parismo.net; by calling 660-327-1009, or by mail at: Virtual Images, P.O. Box 26, Paris MO 65275. If you would like to advertise in The Cattleman's Advocate contact: Angela Young, cattlemansadvocate@sbcglobal.net or call 573-864-6132; (Boonville area) Ed Schler, 660-378-0348; or Chuck Herron at Virtual Images, cattlemansadv@parismo.net or call 660-327-1009. Click here to view our advertising rates.